That’s the famous quote from Al Pacino who played Michael Corleone in the movie The Godfather: Part III. This was my one thought when I saw the demo of PageCloud at this years TechCrunch Disrupt New York. You see I had totally given up on anyone figuring out how to help us non-coders/developers/designers create website without having to be a programming guru. You see, I still remember the day I learned how to write HTML code some 20 years ago. As a former desktop publisher, I was so excited and at the same time so disappointed to learn HTML coding. Back in those days I used many desktop publishing tools that would allow me to create some amazing publications. Programs like Aldus PageMaker gave ordinary folks like myself the power to develop and design almost anything for the printed page. HTML was this new markup language that gave you the power to create basic websites. Unfortunately you had to do all of this by hand typing all the code in an editor. I started out with just plain HTML code an editor. Then along came Microsoft FrontPage. This program gave you the power to see both your HTML code and give you a way to drag and place pictures and text into your own design. Then there was Adobe Dreamweaver and it was better but there was still a huge learning curve to understand how to use it to build websites. Well at this time I was about to give up hope and then along came a web based CMS tool called Joomla. Joomla gave me hope for the future but it was not as user friendly for those of us without a programming background. Next came WordPress. This was a revolutionary blogging tool that has dominated the world of website creation. I was so impressed with this tool that I converted all my Joomla website to WordPress. WordPress has been very very good to me. I have hired many a developer and designer to put together some amazing WordPress websites. Unfortunately I was so hard pressed by some of my website clients to make small changes that I could not do myself. I had to pay one of my developer/designers to do it for me. This was so frustrating and happened time and time again that I got burned out and decided that I was again going to give up the fight. Fast forward to today and PageCloud. You have to see the demo from TechCrunch Disrupt to truly appreciate why I am again so excited but so upset. I was done. I was about to just give up entirely on this dream. I then saw Craig Fitzpatrick, founder of PageCloud take the Disrupt judges though a demo of creating a brand new website design in less than 5 minutes. He did this with nothing but a browser some images he dragged and dropped in from Photoshop and some PageCloud widgets. PageCloud has once again made me a believer in website creation for us non-programmers. Not only was he able to build a website from scratch but he was also able to copy almost all the attributes of an existing website and then import it into PageCloud within a few seconds. Mr. Fitzpatrick did all this without any FTP software or access to the website’s source code. Once the website was imported into PageCloud he could manipulate every aspect of the website environment including background image, text and navigation. It was a complete copy of that existing website. So Mr. Fitzpatrick. I just want to say how much I am going to love and hate you. I love you because you have made my dreams come true but I kinda hate you because I thought I was done with website creation forever. You just had to drag me back in with this awesome display of amazing web based technology. I still can’t believe its true yet I look forward to your public release of your PageCloud platform which you mentioned will be released this summer. 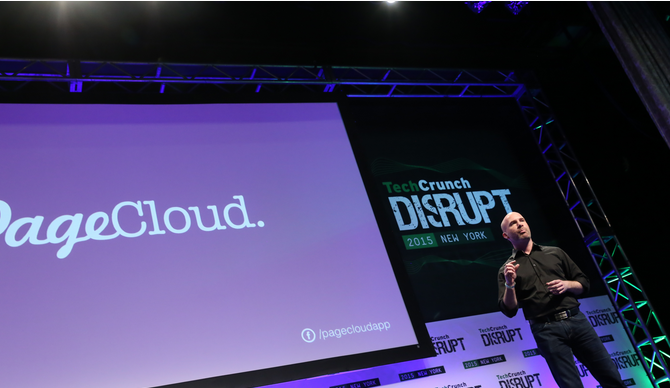 Even though PageCloud didn’t win this years TechCrunch Disrupt award, I am more than confident they will be a huge player in this space and I look forward to using and recommending their service.